After a 4-1 victory in game one, Alee Balanon, with two outs in the bottom of the 10th inning of a scoreless game, ripped a 3-2 pitch into shallow center field, allowing Mayleen Mazon to score from third base, lifting the Sonoma State softball team to a dramatic 1-0 walk-off win over visiting Cal State Dominguez Hills on April 23 to cap the regular season and clinch the No. 3 seed in next weekend's CCAA Championship Tournament in Stockton. 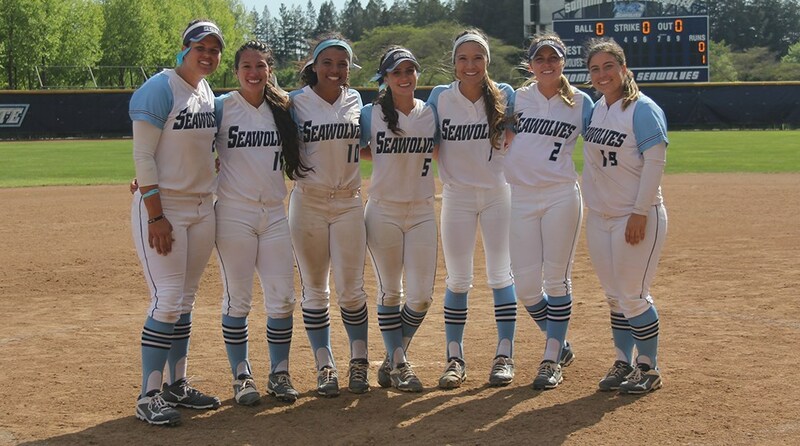 On April 22, after having played the last 23 games away from home, the Sonoma State softball team returned to the Seawolf Softball Field to sweep the doubleheader with visiting Cal State Dominguez Hills by scores of 4-2 and 5-1. Despite a low of 69 by Brandon Lee, matching his lowest round of the season, the Sonoma State men's golf team placed No. 2 in the 2016 CCAA Men's Golf Championships with a 3-2 loss to Cal State East Bay in the final at Silverado Resort & Spa in Napa on April 20. It is the highest finish for the Seawolves in the conference event since 2009. The Sonoma State women's water polo team has earned the No. 2 seed and a first-round bye in the upcoming 2016 Western Water Polo Association (WWPA) Women's Championships at Chabot College in Hayward, Calif. It is the second straight year that the Seawolves have entered the WWPA tournament at No. 2. The seeding for the tournament was determined via a vote of the league's coaches, and was announced on April 22 by the WWPA office. In the absence of an official conference championship, the five CCAA schools sponsoring women's golf got together on April 22 in Pacific Grove for the first Battle on the Bay Tournament. Paced by All-Tournament efforts from Sarah Rotter and Alexis Hayes, the Sonoma State women's golf team finished second in the field, five strokes back of Cal State San Marcos. Daniel Caresio went 2 for 3 at the plate, but the Sonoma State baseball team was held to just three hits in a 6-0 loss to Chico State in the series finale at Nettleton Stadium in Chico on April 24. The Seawolves (16-24, 14-15 CCAA) have fallen two games out of the final playoff spot in the CCAA North Division with eight games left to play in the regular season. On April 23, after falling behind by four runs early in game one, the Sonoma State baseball team rallied for a 7-6 win in 11 innings to open the day, but host Chico State rebounded with a 3-1 victory in game two as the two rivals split a Saturday doubleheader at Nettleton Stadium in Chico. After trailing 8-0, the seawolves pulled within two runs, but host Chico State scored twice in the bottom half of the seventh to put the game away, as the Seawolves lost 10-6 in the series opener on April 22 in Chico.